Hogwarts Day was a few days ago, but it’s never too late to celebrate it! 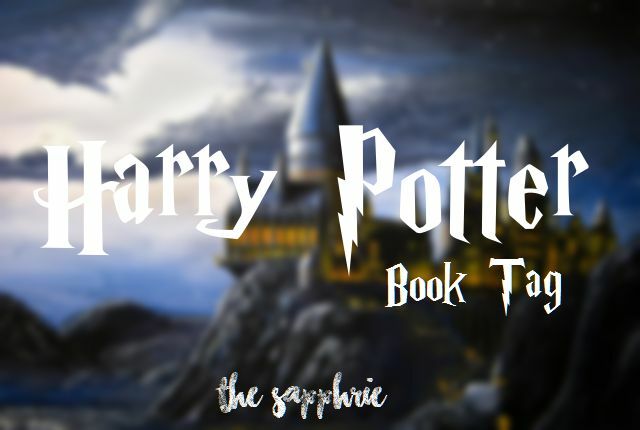 I’m sharing with you the Harry Potter Tag created by Bookidote. I’m currently on a blogging hiatus (but I will be back and strong next week!). I’m taking a break to do this book tag – which I always love to do, because they refresh my memory of the books I’ve read this year, and they can also be helpful book recommendations! Important rule: you can’t use any of the HP books in the answer. Brave New World by Aldous Huxley. (There’s a voice in my head telling me off for messing with a timeless classic). I delved into the novel thinking that it was going to be another 1984 classic, but I was met with a completely different dystopia – and I very much enjoyed that, because, unlike 1984, the novel is portraying our actual reality. It’s a slam on our faces. But I did not like the way the characters were developed. At all. It was really hard to empathize with any of them, except for maybe John – but even his personality was hard to feel pitiful for at times. I give great importance on character development in novels, because they are the ones that can either pull me in or push me away. In this case, though the characters showed how our inner nature is, I felt them as too… blunt. I would say The Rosie Project by Graeme Simsion, but I never finished the series… so I’ll go with Cinder by Marissa Meyer, which I finished in a bit less than a month. I’m still not over how much I love the characters. Cinder. Iko. Kai. Scarlet. ‘Captain’ Thorne. Cress. Wolf. Dr Erland (RIP btw – if I spoiled this for you, oops!). And not Winter (didn’t like her). The A Song of Ice and Fire book series by George R.R. Martin *squeals (I know this is not just *one* book, but spare me the criticism). Just LOOK AT THIS LEATHERBOUND BEAUTY RIGHT HERE! Harry Potter and the Cursed Child. I know – it’s a HP “book”. If you ask me, NO. I do not accept this play as a Harry Potter canon I will never accept it It was a poorlywrittenfanfictionlalalaItdoesn’texist. Yeah. That’s how much that book killed me. Figuratively, and literally when I was flipping through the damn pages. The Hobbit by J.R.R. Tolkien. I read the whole book a few years (?) ago, and by the time I finished the book, I don’t think I could even tell you what the main plot was about. I usually find it hard to follow fantasy books (except for Game of Thrones, obviously). I plan on re-reading it, and the rest of the series, this year. I’ll probably watch the films first, though. Mm, probably Sense and Sensibility, by Jane Eyre. The contrast in personality between the 2 sisters, Elinor and Marianne, just resonated so much with what I emotionally am, and what I aspire to become, personality-wise. It would have to be The Virgin Suicides by Jeffrey Eugenides. I saw the film first – it made me feel uneasy – and then I read the book – which didn’t make me feel any ‘easier’. Just to give you an overall idea of the book, the story reminisces about the suicides of five (seemingly) normal American teenagers. Gaah there are so many! I’ll probably go with Aristotle and Dante Discover the Secrets of the Universe by Benjamin Alire Sáenz. The plot revolves around the lives of two boys and their teenage struggles – so cliche, right? But the author knows this, and twists the plot and develops the characters’ complexities in ways that just left me in love with the book. *Special mention*: The Nightingale by Kristin Hannah. This was such a beautiful book, taking place in the midst of of World War II *cries*. I hope you enjoyed this tag! Remember – if you’re a Harry Potter fan, you’re immediately tagged! This tag seems like so much fun! Well just from your excellent book taste I can tell I’m going to love your blog. I hated Cursed Child and LOVED Aristotle and Dante. Also I think I could commit to reading A Song of Ice and Fire if I had those incredible editions. Yass! The first 2 books are quite controversial, and I’m glad we can agree on how awful one is, and incredibly amazing the other is. As for A Song of Ice and Fire, I’m currently reading them on the Kindle. I wanted to wait until I got the leatherbound copy to read them, but then I realized that I would probably ruin the beautiful physical books (or tomes, actually), so I’m just gonna read them on the Kindle 🙂 And buy the physical copies to gaze at.